We all want to attend KLFW, some are very fortunate to be invited, some has to work to be on the list *cue awkward laughter*, while some others has to wait and pray they would score an invite for next year's KLFW. During fashion week, you are going to meet and be surrounded by a lot of people. You will oftentimes be introducing yourself and networking with others either from the same industry or not. So instantly, you would make sure your breath is in check. And knowing you are attending a fashion show, that just means your outfit also has to be slightly above your bare minimum. The list can be endless and fashion week must be taken seriously. As we all know, Kuala Lumpur Fashion Week is a time where we witness celebrities, fashion gurus, designers, socialites, and many others giving it all their best; from the sunglasses they pair their outfit with to the lipstick colour that suits their mood, trust me, it’s not easy attending a fashion show. And what could go wrong when a room is filled will almost all walks of life? Quite a lot, actually. Sometimes, rules are good. Rules allows a show to be coordinated accordingly, rules sets a certain standard and class to a person, or in this case, event, and when rules are followed, naturally, good things tend to happen. Fashion week, in all its hectic glory, doesn't always bring out the best behaviour in us. And I am not wholly innocent either; trust me, I got a little snippy with some of the usherers when they ask me what felt like redundant questions as I was frantically shuttling between shows and the office. There is a fashion week etiquette which even the most seasoned fashionistas tend to overlook. 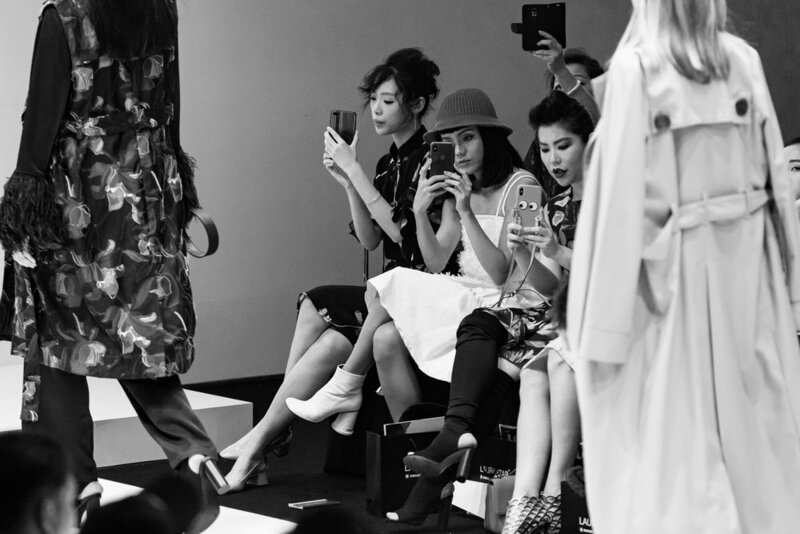 Having attended Kuala Lumpur Fashion Week for two years now, I have always seen celebrities and socialites with their plus ones and sitting with them on the front row much to the annoyance of other guests. Also, the audacity of sitting in somebody else’s seat? It's for a reason that seats are assigned to one's publication. Let’s also not forget those who takes the cliched notion of being ‘fashionably late’ literally - you are not supposed to be later than the first model who walks out and still expect your seat to be available. Penning the lowdown on the dos and don’ts as we witness the ultimate zenith in fashion first hand, here’s a checklist of whether we have lost our sense of common courtesy. To fully understand the broad spectrum, I then spoke to none other than a model who walks down the runway for KLFW, a designer whose collection was absolutely breathtaking, and a guest amongst the fashionable crowds of KLFW. Out of her busy schedule, I am very grateful that Tinie, Malaysia’s sweetheart and supermodel, had taken the time to enlighten us on the dos and don’ts that every fashion show must have. With her years of experience in the industry, it is no surprise that she would have a list for us.“Do wear suitable outfits. Don’t be a fashion victim, but instead, be a trendsetter,” she pointed out as most of us are keen to always outshine each other at events like this. She also reminds us to always sit at the seats allocated for us and be sure to applaud the designers and their hard work. “When the models are showcasing the designers’ collection on the runway, I would like to remind everyone to be polite, pay close attention and look at the clothes instead of your phone,” she further relayed.As fashionable as it is to be late, Tinie stresses the point that we must come on time, as most shows are delayed as the designers are waiting for their invited guests to filled up their designated chairs. “I have even witnessed latecomers, especially the front row guests, walking along the pathway when the models are walking onstage and guests crossing-over the stage or photographers pit when the models are walking. “Seatings are arranged for a reason so everyone who attends a fashion must respect that. I noticed there are some who desperately yearns for front row seats, without feeling remorseful or ashamed by removing the person’s name on the seat,” said the supermodel, adding that finally, please do not take other people’s goodie bags. As for Jovian Mandagie, one of Malaysia’s top fashion designers as his quality and intricate collections never fail to impress us, he also believes that every KLFW attendee must arrive punctually and always respect the seats allocated to you so that the show can go on smoothly. “Don’t forget to have a good time and take as many photographs as you wish so that all the designer’s hard effort can be acknowledged and celebrated by all,” he said.Like all fashion shows, being fashionable is necessary but Jovian reminds us to never ‘over-style’ yourself; less is more afterall and this also goes for perfumes. When you have RSVP but failed to show up, Jovian reminds us to be responsible by always notifying the organisers so that seatings can be rearranged if necessary. And finally, the celebrity designer also reminds us to not block the view of others nr walk out during the shows as he unfortunately witnessed these occurrences. I can vouch for this as I too was sat next to someone, who was selfishly blocking the view even after I respectfully told her to lean back. And finally, what better way than to gain insider perspectives than with a KLFW guest with ‘all access’ pass? Redza points out to us that if you are attending the shows and you are sitting on the front row, then without a doubt, you have to behave. When you sit at the front row, you get the best views of the designer’s collection so naturally, you have to also respect those sitting at the back. “If you noticed, the first four rows, the guests are seated at the same level unlike those on the benches where their views will not be blocked by anyone else. And also, when front row guests insists on bringing and sitting next to their photographers. “When these photographers are required to take pictures, they would have the audacity to stand up which then blocks the view for those sitting at the back. If you are a photographer and you need the pictures, then please remain only at the photographers pit,” he said. However, based on his observation, Redza is also quite impressed with 2018’s KLFW attendees as he felt, they were too overdressed in the previous year whereby there were one too many fashion victims instead of fashionistas. “From trench coats, to seven-inch heels and wedges, to sunglasses for the night shows, I am glad this year, majority of them were rather sensible with their outfits,” he added.There are do’s and don’ts of the runway one should adhere to when attending any fashion shows. We hope this helps make sure you have skilled up on these etiquette rules which will help you put your best fashion foot forward.